This scanner is a key tool to use if you want to prepare for modernizing your classic sites as it will give you factual data about how easy it is to modernize your sites. Using the dashboards generated by the scanner you'll be able to drill down on the "modernization readiness" of your sites and plan the needed remediation work where needed. 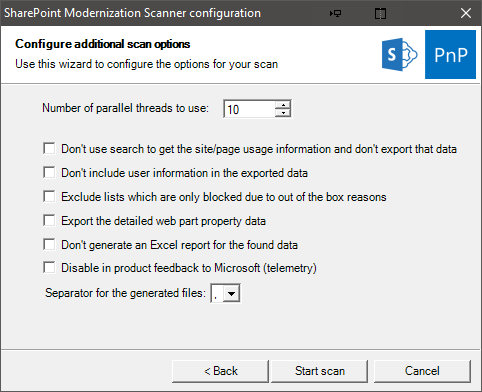 The SharePoint modernization scanner only is supported for running against SharePoint Online. Once the preparation work is done, let's continue with doing a scan. 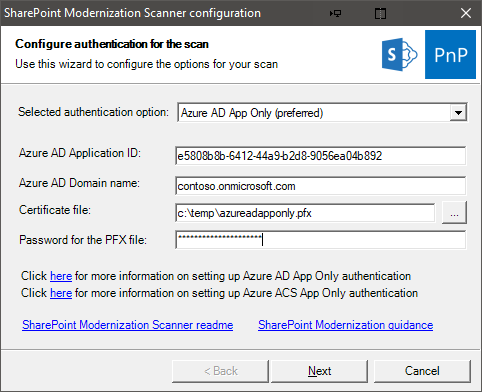 The easiest approach is to simply launch SharePoint.Modernization.Scanner.exe as the scanner does have a UI. Alternatively you can start a (PowerShell) command prompt and navigate to that folder so that you can use the scanner via command line. This chapter will walk you through the UI option taking a typical full scan. Start by launching the the SharePoint.Modernization.Scanner.exe. The first page of the modernization scanner wizard asks you for authentication information. The scanner supports three options, select the one you need and fill in the needed information as described below. Note that ideally you use an app-only model as that will ensure the scanner has access to all sites it needs to scan. This page allows you to define which sites are being scanned. The scanner supports scanning the full tenant up to individually selected site collections. Scanning the complete tenant is often the recommended approach as that will give you modernization reports for all. If that's your choice then simply fill your tenant name. 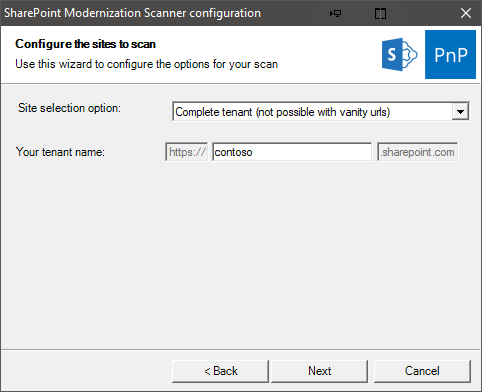 Note that this approach does not work if you're tenant is using URL's that do not end on sharepoint.com, if that's the case you need to use one of the two below options. 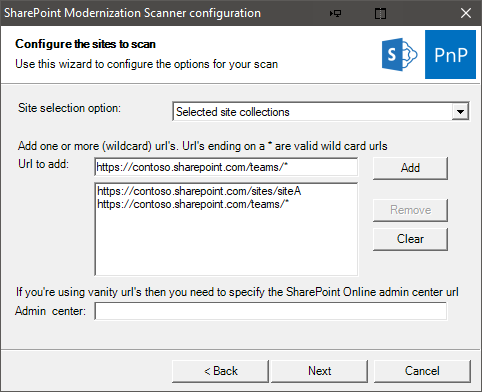 If you're using URL's that do not end on sharepoint.com (so called vanity URL's) you'll also need to specify the URL of your tenant admin center site (e.g. https://admin-sharepoint.contoso.com). As a third option you can provide the scanner with a CSV file listing the site collections to scan. 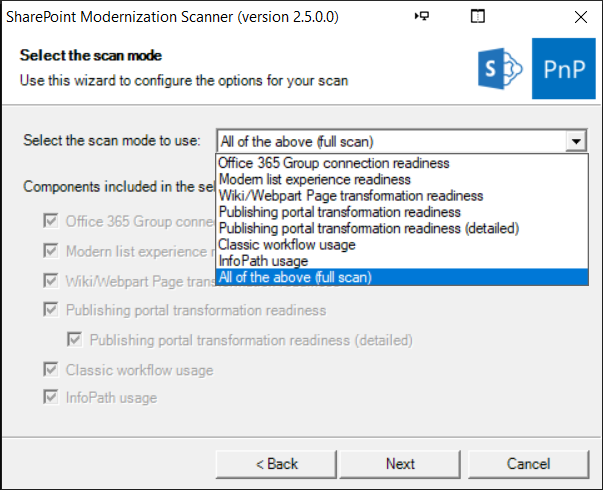 The SharePoint modernization scanner does support multiple modes, depending on your modernization mode you might want to scope the scan to a certain area or alternatively simply do a full scan. Select the option you want in the dropdown and then the checkboxes will show which components will be included in the scan. Note that the "Office 365 Group connection readiness" component is the main component which will be included all scan modes. As a last step you can tweak the scanner options. Depending on the earlier chosen scanner mode some options might be disabled. -r, --urls                               List of (wildcard) urls (e.g. --help                                   Display this help screen.